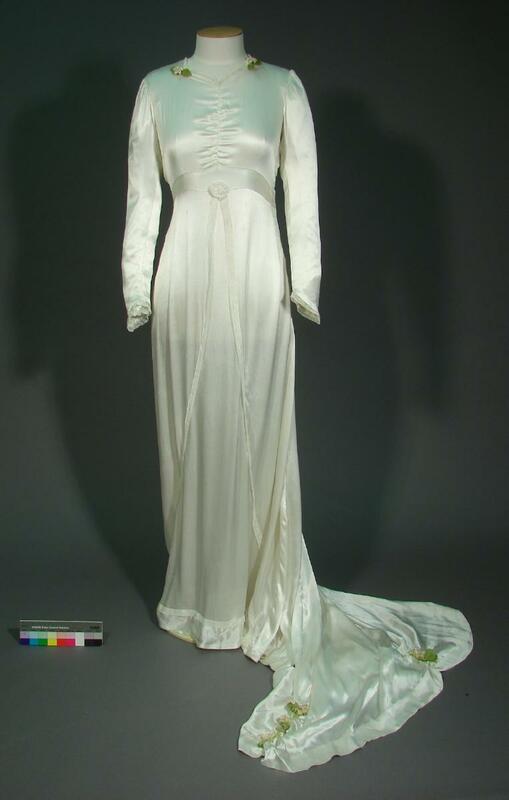 This graceful long-sleeved wedding gown was worn just months before the outbreak of war in 1939. It represents the full flowering of 1930s wedding fashion. Soon afterwards the outbreak of worldwide conflict temporarily reigned in the inclination as well as the practical opportunity to celebrate in such style. The dress is made from an ivory satin, with a heart-shaped neckline finished with a spray of orange blossom. The train is shirred to form three scallops, which were finished with sprigs of orange blossom. The full-length embroidered veil was held in place by the dainty coronet and the bride carried a sheaf of lilies. Doris Clement wore this dress when she married John Sabiston at St Michael’s Church, Anderson’s Bay on 19 April 1939. It was made by Kitty Larking, a local dressmaker, with fabric from Ross and Glendinning where Doris worked as a shorthand typist. The date was Doris’s 21st birthday and she had been given a choice between a birthday celebration or a wedding. After an engagement that had already been 15 months long, Doris chose the wedding. Her dress was worn again eight years later by her sister Neva, who had been one of her bridesmaids. This custom of recycling wedding dresses is quite common, especially within families. Doris died in Dunedin in 2002 aged 84.